Not A Member? Click on button below to create a new account and register your DJCalendar software. Quickly learn how to use DJCalendar with our new How To Videos! Introducing New Webservices Technology Over SSL To Securely Store And Access Your Data "In The Cloud". "DJ Calendar is a user-friendly software program providing all the tools you need for managing and organizing your Entertainment Business." Try It For Absolutely Free! 3. Try It For Free! Whether your a Disc Jockey, Catering Company, Live Band, Event Planner, Photographer, Wedding Coordinator, Airplane Pilot, Coal Miner's Daughter... you can design your own data entry form and create an unlimited number of templates to capture customer and event information. DJCalendar Is Ready To Go! Enter Your Customer And Event Information And Your Ready To Print, Fax, Export To PDF, or Email Your DJ Contracts And Customer Documents. 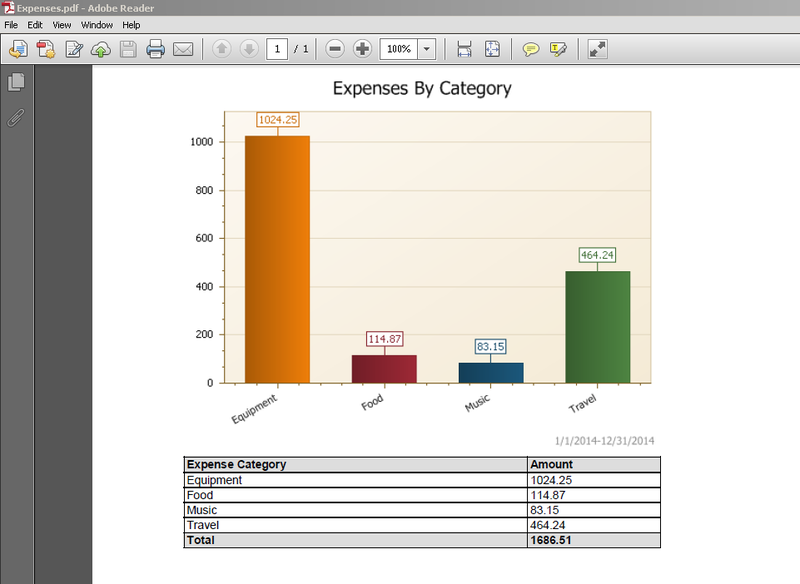 Templates include DJ Contracts, Invoices, Payment Receipts, Work Orders, Thank You Letters etc.. Have your own forms? No problem! 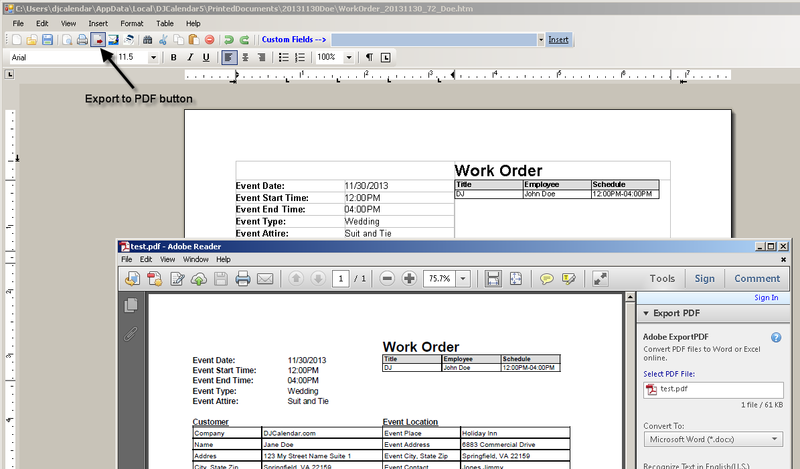 Add an unlimited number of your company documents to the Print menu or use our WYSWYG editor to customize the included templates. Store Data On Your PC or Securely Host Your Data "In The Cloud...it's your choice! We have two license options to choose from...DJCalendar Cloud and our Traditional DJCalendar License. 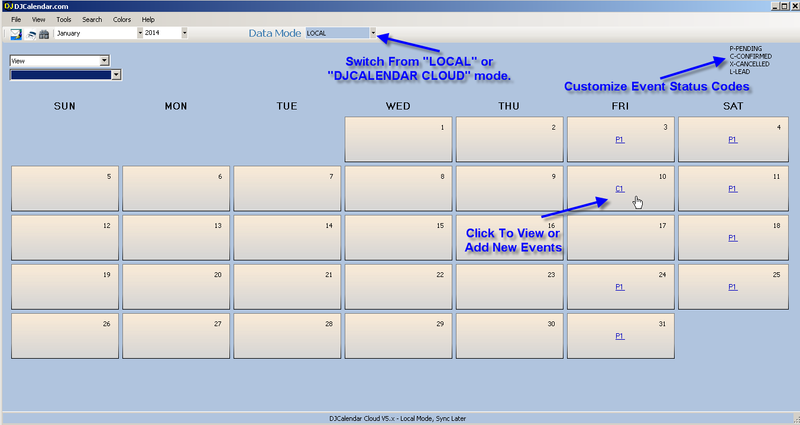 DJCalendar Cloud offers the ability to securely host your data "In The Cloud" so you can share and access your data across multiple offices and employees or you can choose to purchase DJCalendar for a one-time fee and store your data on your PC. *Trial version is actually the "Full Version" except a watermark is printed on documents until you register your software. Licensing DJ Calendar V5.x is a one-time fee! 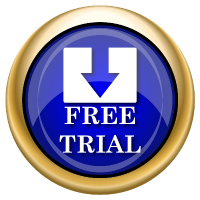 We're so confident that you'll like our software, you can Download the "Full Version" for free and "Try It Before You Buy It". The trial version puts a "watermark" on printed documents until you register your software. Need To Share Real-Time Data? Get DJCalendar Cloud For Only $10.00/month. Sign Up Today And Get First Two Months Free! Need to access your data from anywhere from multiple employees or locations? Our DJCalendar Cloud feature includes a monthly subscription to securely host your data in the "cloud". Select "DJCalendar Cloud" on the order form to get started for FREE. DJCalendar Cloud is the same desktop software, just utilizes new webservices technology over SSL to securely store and access your data "in the cloud". No Contract, No Termination Fees, Cancel Anytime! Going somewhere with no access to internet? No problem, DJCalendar is a desktop application installed on your laptop or PC and you can optionally work in "disconnected" mode and sync your changes to your "DJCalendar Cloud" database later. We have re-invested our efforts in the DJ Community and have built DJCalendar from the ground up utilizing Microsoft© .Net Framework technology. DJCalendar V5.x includes new ClickOnce© capabilities allowing us to publish updates from your suggestions and have your DJCalendar V5.x automatically update itself. 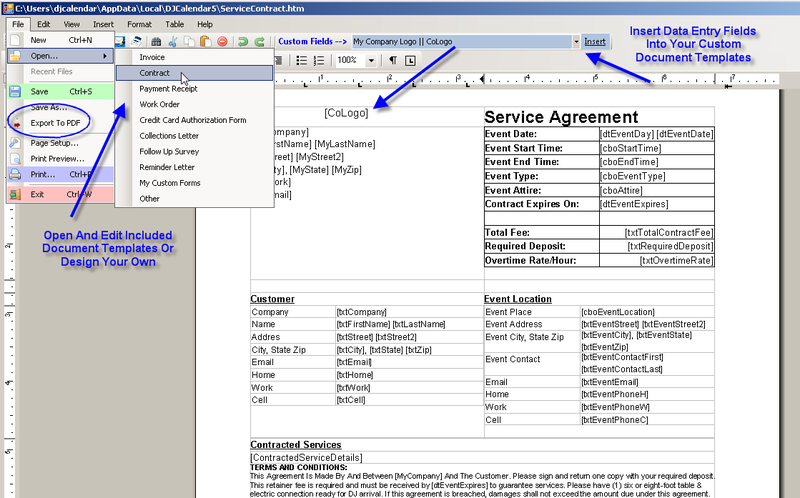 Use The Custom Form Editor to customize your event contracts, customer invoices, thank you letters and more. Have your own forms? No problem! Add an unlimited number of your company documents to allow you to Print, Fax, or Email directly from DJCalendar. Export your customer documents to PDF... DJCalendar provides the ability to export your custom documents to PDF throughout the various forms. 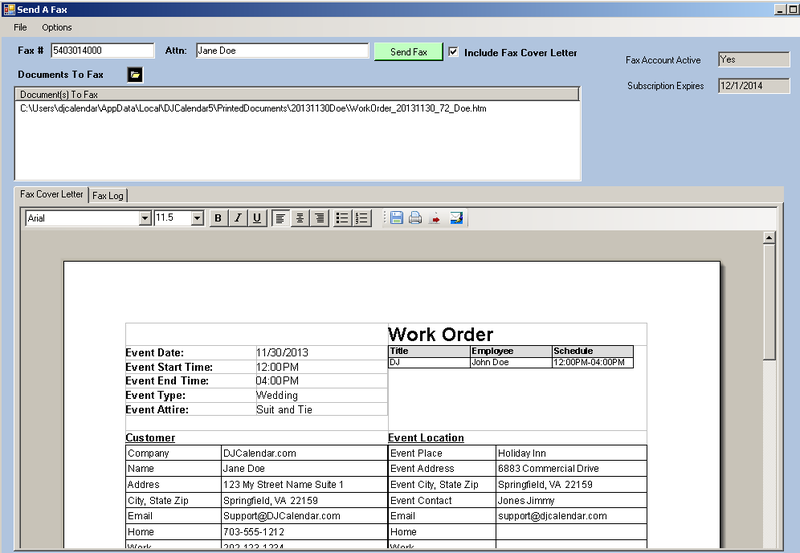 You can Print, Fax, or Email your customer and event documents directly from DJCalendar. Print Envelope labels directly from DJCalendar... DJCalendar includes all the standard label formats where you can select and query your DJCalendar data or import a list of names and addresses from an Excel worksheet. Retrieve Turn By Turn Driving Directions with a single click. Click the "Get Directions" button and automatically insert driving directions on your "Event Locations" form. Print, Export to PDF, Fax, or Email directions to your Employees. Process secure credit card transactions directly from DJCalendar... Sign up for a merchant services account and begin accepting credit cards to increase your revenue. Click here to view brochure and available merchant products. Main Calendar -User Friendly Calendar Interface..simply click to view\add events. 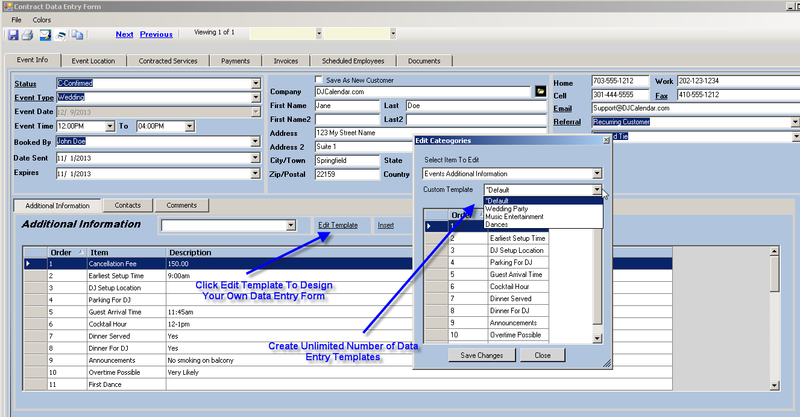 Contract Form - Design your own data entry template for capturing customer event information. 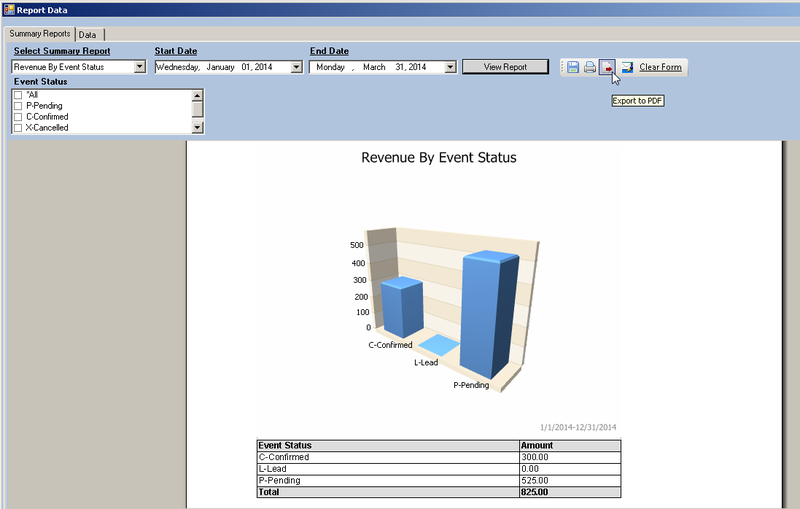 Revenue Reports - Print various revenue reports and conveniently search and export your customer and event data. Event Location - Maintain a database of all your event locations..automatically populate form from an existing place, or enter a new location. New Mapquest API to automatically insert driving directions to print, fax, or email to your employees...simply click the Get Directions button! Contracted Services - Add your product and services to perform at this event. 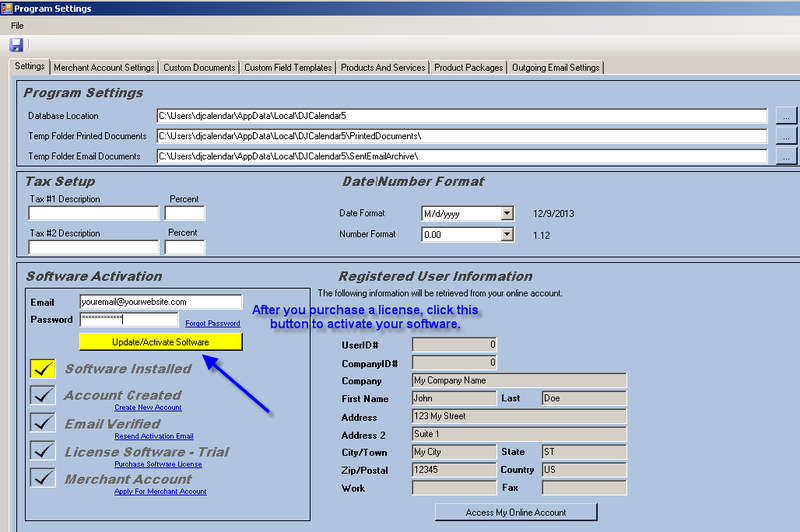 This information can be printed on the contract, workorder, and templates included with the software. 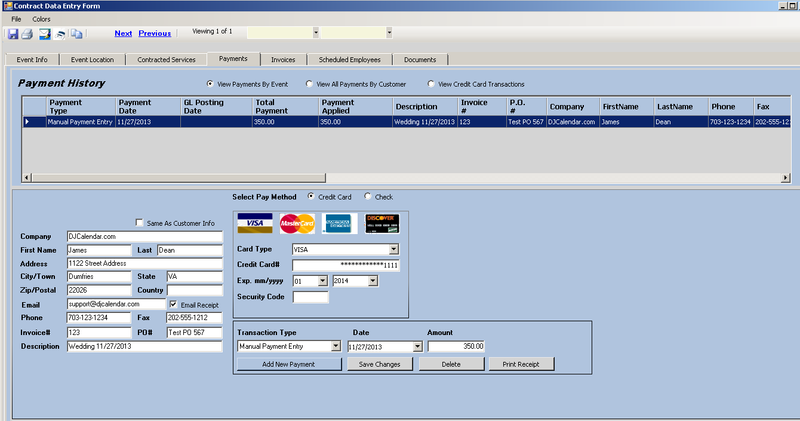 Customer Payments - Record your customer payments on this form. 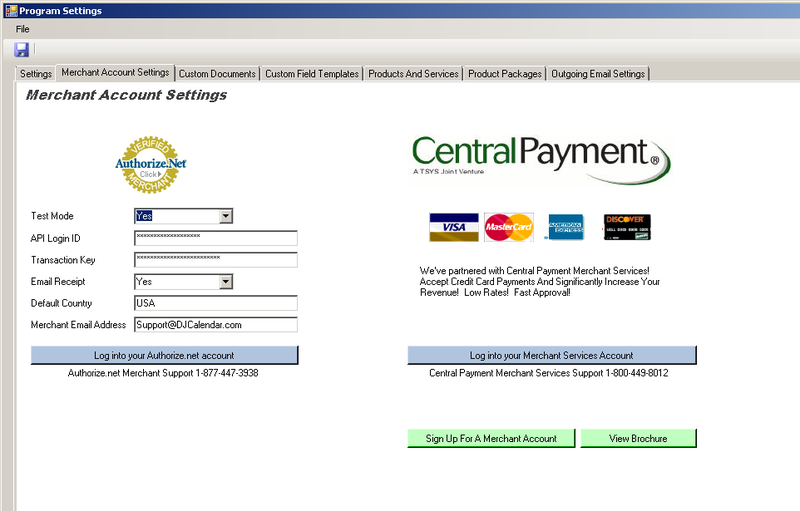 Enter manual payments or sign up for Merchant Services and process credit cards. 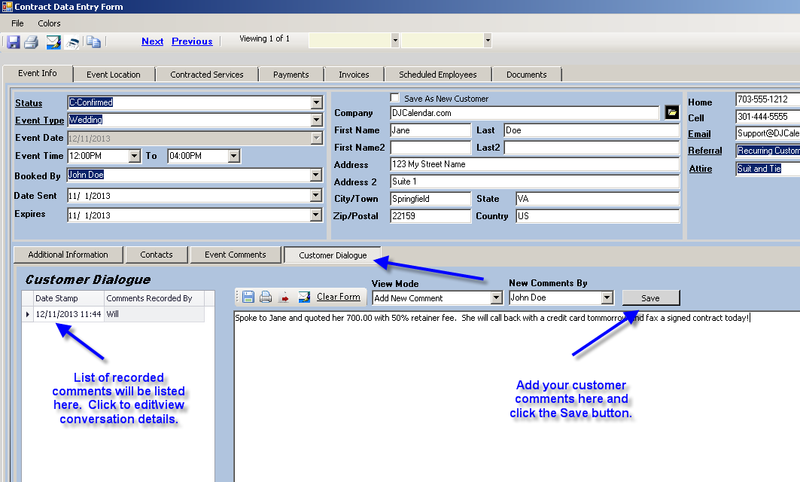 Print, Fax, or Email Payment Receipts to your customer. 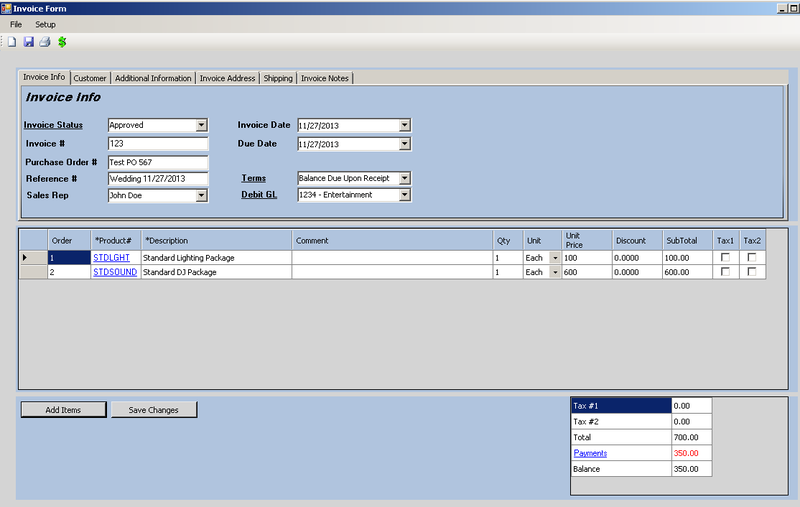 Invoice Form - Add Your Products and Services to Generate and Print, Fax, or Email Invoices to Customers. Template Editor - We've included approximately 10 document templates i.e., Contract Service Agreement, Invoice, Payment Receipt, Work Order, Customer Survey, etc...Design your own using the included Editor..the sky's the limit! 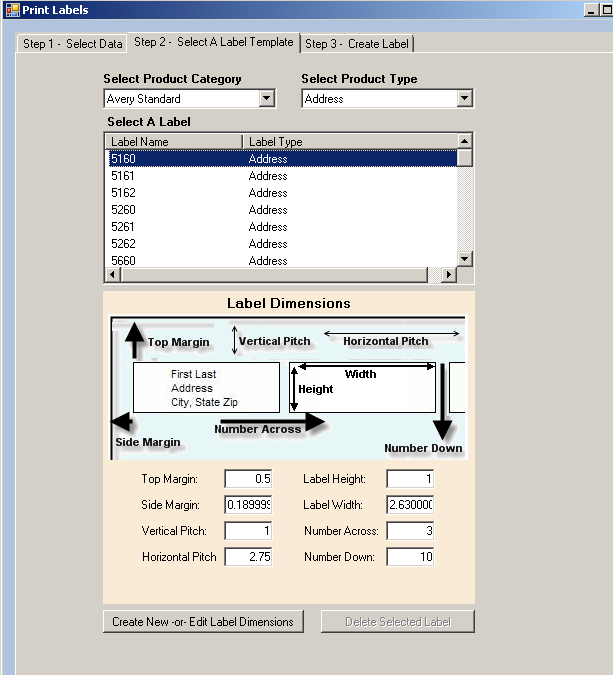 Label Printer - Print envelope labels from an Excel worksheet with list of names and addresses or a query from existing Customer Event data. Custom Products And Services - Set up your products and services and manage them by category. 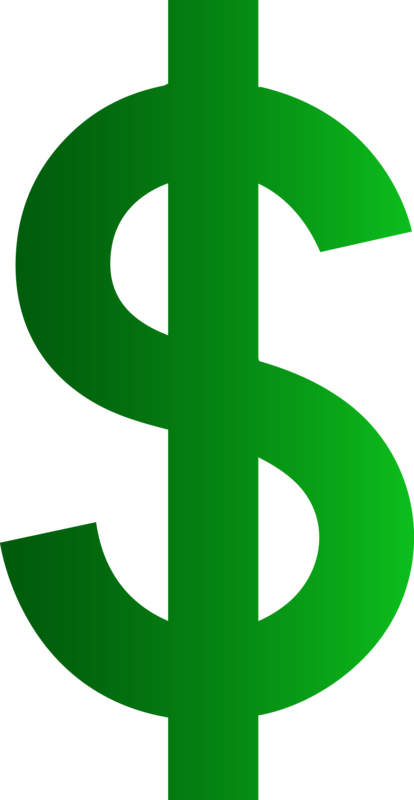 You can later add these products and services to an event or customer invoice. Merchant Settings - Sign up for merchant services to accept credit cards and use this form to enter your merchant settings. PDF Export - Easily Export any of your custom documents and templates to PDF..simply click the Export PDF icon. You can print, fax, or email your documents directly from DJCalendar. Fax Form - Fax html, pdf, word, text documents directly from DJCalendar...requires 3 month or 12 month subscription for as low as $10.00/month. Driving Directions - New Mapquest API which will provide you with turn by turn directions. 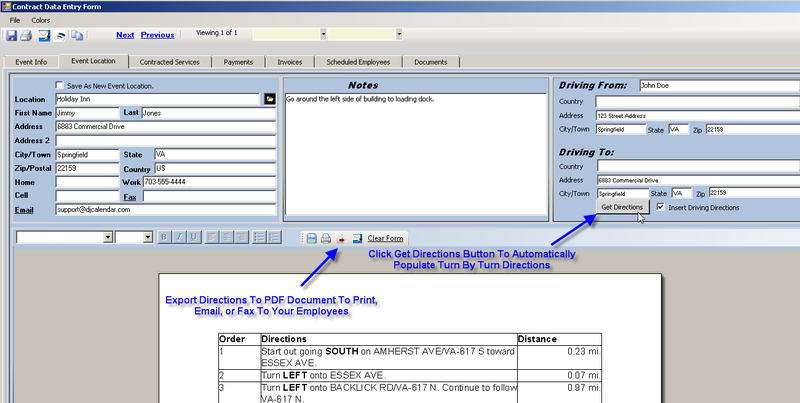 Simply click 'Get Directions' button, then print, fax, export to pdf, or email to your employees. 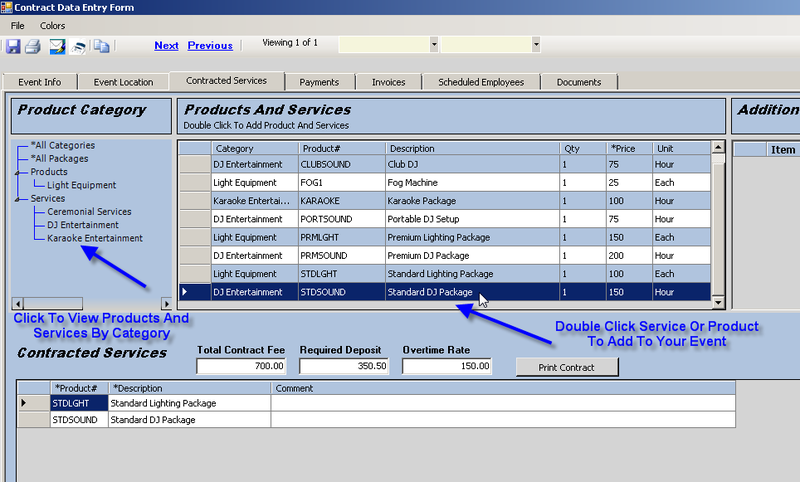 Customer Contact and Dialogue - Display all customer conversations company wide...from the Main Calendar, select 'View' from the menu bar, then select 'Customer Dialogue'. Search Customer Conversations - Print, Fax, Email, or Export to PDF.